This is the story of Folke Bernadotte. 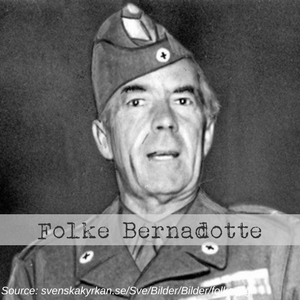 Count Folke Bernadotte was a Swedish diplomat and Vice President of The Swedish Red Cross during World War Two. Folke Bernadotte organized the White Bus rescue action together with the Danish and the Norwegian Exile Government. A rescue expedition for the Scandinavian concentration camp prisoners had been discussed for some time. During 1944, concrete plans for a rescue action began to take shape in Norway. At the end of August 1944, a brief list of some 6,000 prisoners was submitted to the Swedish Foreign Ministry. World War II was coming to an end between 1944 and 1945. Adolf Hitler ordered to burn the concentration camps, eradicating all evidence. As the war approached the end, many leading Nazis hoped that by negotiating with the Allies through Folke Bernadotte, they would get off with a lighter sentence. In the spring of 1945, Folke Bernadotte met with Heinrich Himmler in Germany. The negotiations resulted in the Swedish Red Cross being able to help organize a rescue operation to repatriate Scandinavian prisoners from the concentration camps. The Swedish Red Cross ran the rescue operation in cooperation with the Swedish military which contributed equipment and volunteers. Bernadotte was originally assigned to retrieve Norwegian and Danish POWs in Germany. He and his rescue team returned to Malmo, Sweden on the first of May 1945, the day after Hitler’s death. Bernadotte succeeded in rescuing approximately 15,000 people from Nazi concentration camps, including about 8,000 Danes and Norwegians and 7,000 women of French, Polish, Czech, British, and America nationalities. The Swedish Red Cross expedition to the Nazi concentration camps in March and April of 1945 was the largest rescue effort inside Nazi occupied territory during the war. The White Bus rescue action rescued approximately 17,500 Holocaust victims during 54 days in the spring of 1945 before the liberation. The missions took around two months, and exposed the Swedish Red Cross staff to significant danger. To avoid being bombed by the Allied air force bombing Nazi territory, the buses were painted white. Folke Bernadotte is a true example of a person with fearless determination to rescue humans in need.